Disney World has painted boxes at their bus stops to make sure a scooter fits within the space as defined by Federal law which is 32 X 48 inches. This is defined by the American Disabilities Act public transportation. From our measurements it is the OUTSIDE of the thick painted box line not the inside that is the 32 x 48 inch space. The law does not prohibit you from turning the front wheel, un-reclining the seat or removing a basket to have your scooter fit. So be prepared and be informed. 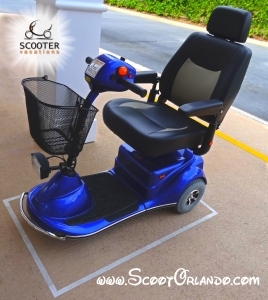 Many ADA approved Electronic Convenience Vehicles (ECVs) also known as Mobility Scooters are too large to fit within this space. All of our Scooter Vacations rental models fit within the ADA law defined space of 32 x 48 inches. Click here is see the six models we have to choose from to rent that all fit within the allowable space. Including scooters with larger weight capacities up to 550 Lbs. capacity.